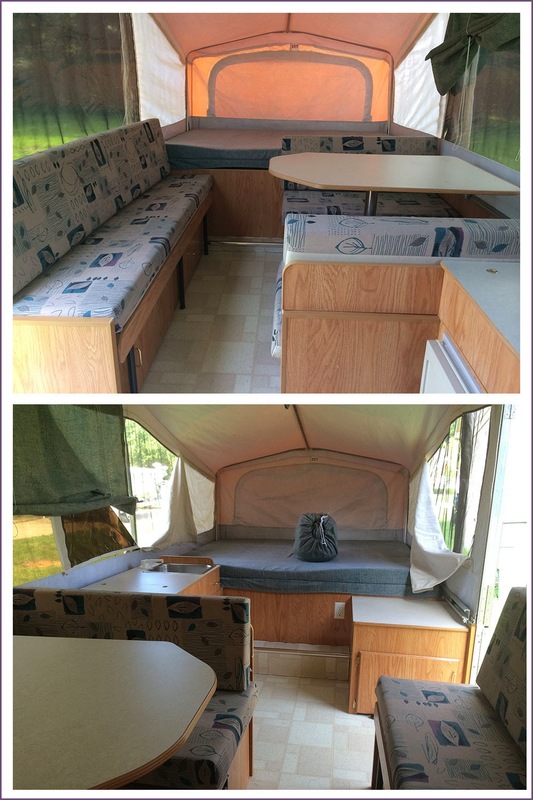 In the hope of having more adventures, Pat and I recently purchased a Jayco pop-up camper. We wanted something lightweight but that could also sleep several people. And, I insisted on air conditioning. (We do live in South Alabama.) 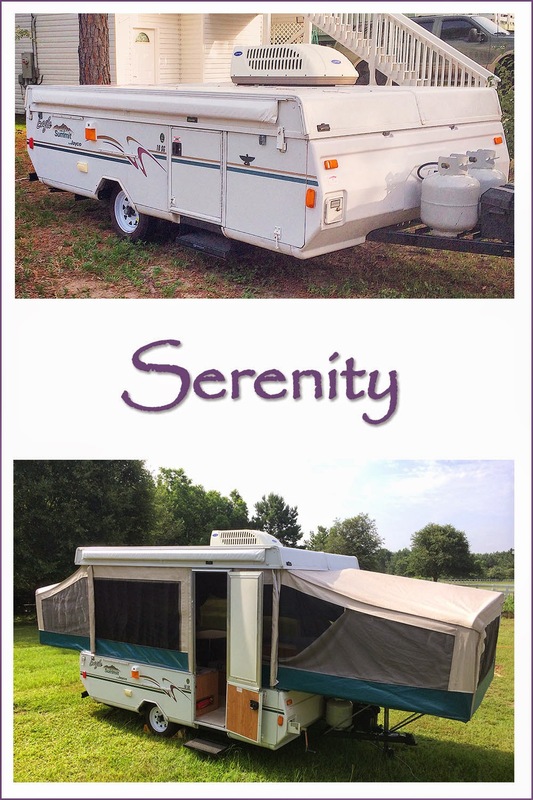 After much searching of camper lots, sides of the road, and Craigslist; we found this baby that we're calling Serenity. From the outside, resting and popped up. The inside includes both a king and a queen bed, dining area, 'couch', and small kitchen space. We've got a trip planned to take her out and are semi-scurrying to get ready. I like to be prepared. In fact, we're still considering pulling her somewhere close for a night or two for a trial-run before the actual trip. In the meantime, we've been making a list of what we think we need. 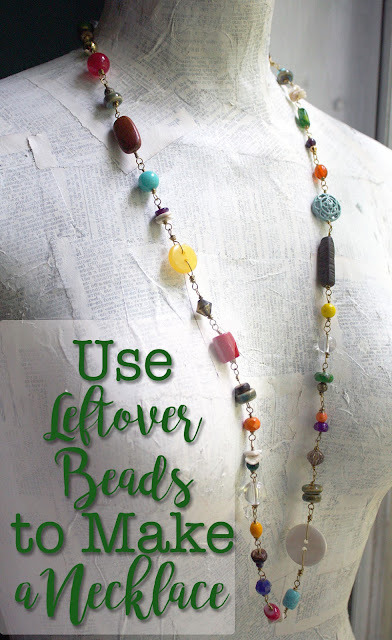 It's a really long list (likely to get longer), and we've been gathering items willy-nilly from the internet and thrift stores (hence my urged thrifting excursion this week.) 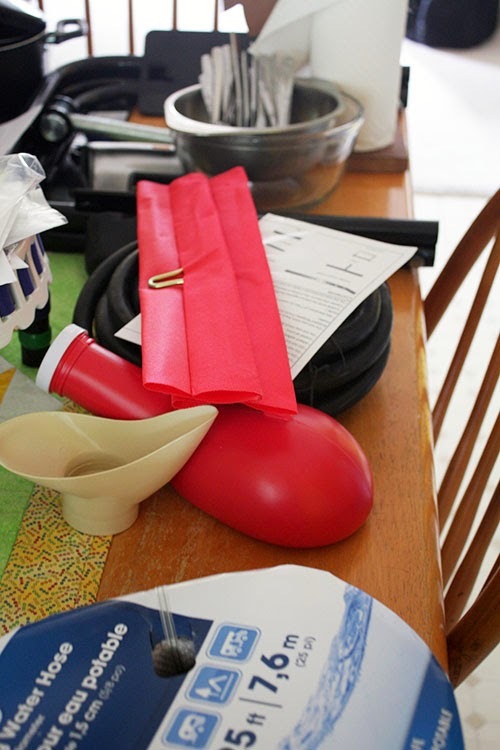 These supplies have just been piling up on the dining room table. Yes, that is a 'personal toilet' on my dining room table. It continues to gross me out, but I know it's brand new and clean. I love that there is a 'lady' attachment for it. I'm pretty excited about getting to decorate the camper. Though my desire to redecorate the big ole RV trailer never did come to fruition, I'm hoping we can actually get our butts in gear to update this one some. I want it to have a mis-matched, cozy, homey feel. I kept that in mind as I did the thrift shopping. 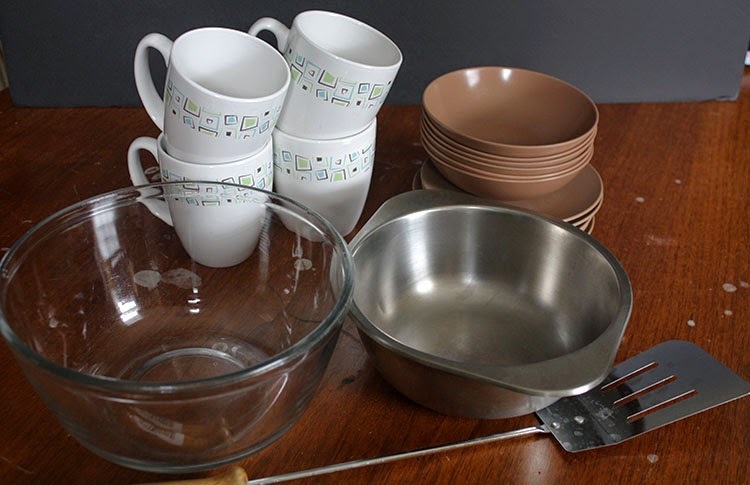 I scored some coffee cups, mixing bowls, small plastic plates and bowls, spatula, and set of three pots with lids (not pictured) for some serious steals. 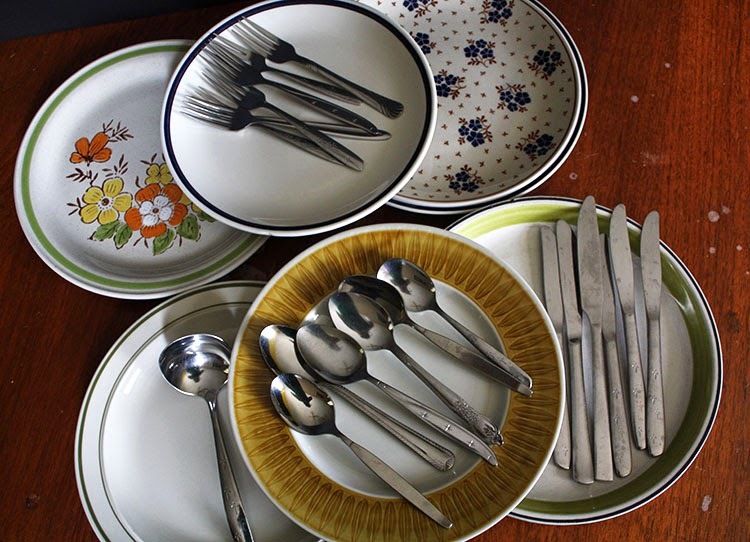 As well, I picked up plates and silverware - making sure it didn't match for more of that lived-in look. In addition to the list and supplies above, we'll take the condo box with us when we go camping. And, I've got to find some way to store all these supplies in such a small space. There's so much to think about, I know we're probably overlooking some essential items that we'll need more than a "small tv" and "microwave" as listed. So, if you are an experienced camper (or just someone with advice), please leave your suggestions and recommendations of what else we may need and how to store it in Serenity. I definitely don't want to get too far from home and need some crucial supply. Just thinking about it stresses me out and camping is supposed to be relaxing. You lost me at, "portable toilet!" Hahaha! You are going to have so much fun traveling around! Go see the world! I am curious just how the air conditioning is going to work when most of the sides are screened. Won't the cool air just rush out? Shai, Good question. You can't see it in the photos, but there is a thick plastic sheeting that zips over all the screens and seals the camper. Granted, it's not air-tight, but the A/C stays in and the heat stays out for the most part. We camped in the backyard Saturday night and were pretty comfy in there. Thanks for the concern! We had a pop-up when the kids were young and loved it! We have some wonderful memories of fun times camping! Have fun! Oh, you may want to look for some artificial turf to put just outside the camper - it helps keep the camper clean. I enjoy camping but would absolutely love it with a camper. Have fun and enjoy! Sounds awesome! Never been camping like that, only with tents small enough to sleep in when we were much younger :) You're so organized but I know that already! Don't stress, they say creative people are better at handling situations! What about basic drugs and insect repellents (sorry if I overlooked them in your list)? This looks awesome!!!! Congrats on your new toy!! Camping is awesome and I"m sure even if you forget a few things, it will still be okay. Great toilet btw!! hahaha. I love to camp, but the toilet piece is always the part that I have the most issues with! LOL! I have never liked camping but sometimes seeing those sweet retro campers all decked out in style makes me want to try it. Then I remember how loud my husband snores and I quickly discard the idea. Looks like you have things in control. Have fun!